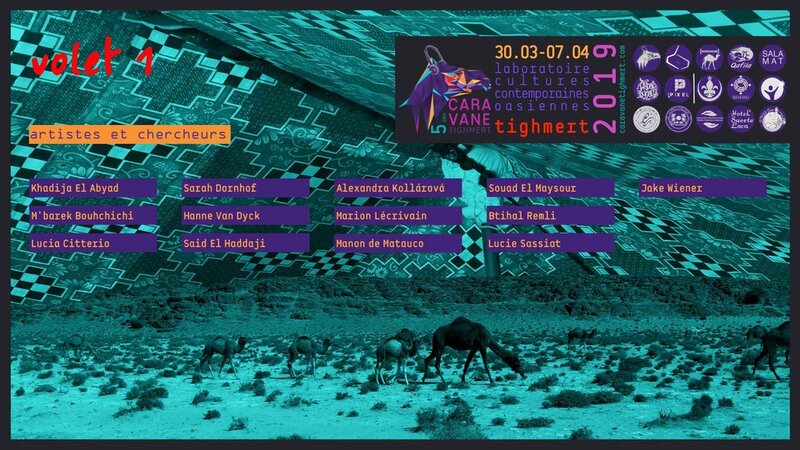 The 5th edition of Caravane Tighmert will take place next week in the oasis of Tighmert (Guelmim, Morocco), and it will have three parts, researches, visual and performing artists / music / art students from Tetouan (INBA) and Paris-Cergy (ENSAPC). These are the artists and researches that will stay from Saturday the 30th March to Sunday the 7h April. This day would not be possible without the support and co-organization of Tribal Dynamo and Sud Pixel. In parallel, they also organize a festival "For the Love of Desert" with Hoba Hoba Spirit (among others) and which will also take place in Tighmert between 5 and 7 April, in the garden Chebri Med Najib (in front of the Hassanie House. From April 7th to 14th we will welcome students from the National Institute of Fine Arts of Tetouan (INBA) and National School of Arts of Paris-Cergy (ENSAPC). For a week, they will work on several aspects of the oasis and its surroundings. On the 17th of April they will present their researches at Le 18 Marrakech. A big thank you to Claudia Triozzi (who came twice to Tighmert) for her interest in showing her students the possibilities that the oasis offers to contemporary creation. Marsad Drâa, Maison Hassanie, Association Qafila (جمعية قافلة التنمية), SALAMAT, Tribal Dynamo, Sud Pixel, Scouts Tighmert (جماعة اسرير تغمرت- ), Le 18 Marrakech, Réseau Esprit d'initiative de l’Economie Sociale et Solidaire "" Guelmim"", Association Sidi Elghazi Guelmim جمعية سيدي الغازي للعمل الاجتماعي والتربوي, FSJES - Centre Universitaire Guelmim, École Supérieure de Technologies - Guelmim, Association Provinciale des Productrices de Couscous, Hotel Suerte Loca Sidi Ifni et Institution Al Manar Sahara. Without forgetting our artistic grandfathers, M'barek Bouhchichi and Mohamed Arejdal.